I have been immersing myself in the history of the Wornall House these last few weeks and I’ve learned as much about the present as I have the past. What strikes me most is the depth people have for caring about the past. The archives I visit, the historic objects I observe, and the meetings I attend all indicate the collective concern of individuals toward preserving the past and handing it down to future generations to study, analyze and evaluate. I feel the weight of the generations before me–as well as my profession and my moral obligations to myself and the society I live in–tasking me to do the best job I can in dissecting this history to learn from it and pass it down to the next generations. Like teaching, as a historian I am always asking myself; am I doing a good job? Have I learned all I can? Am I fair and honest? Am I a worthy of being a steward of history? What one person deems an important piece of history and worth preserving, such as genealogy, ephemera, or financial records, may be insignificant to another, but all these types of things wind up in archives. I’ve been sorting through some archives at the new digs of the Jackson County Historical Society piecing together the puzzle of the past so that I may tell a compelling story of the Wornall House. I did not think I would be interested in genealogy, but I got sucked into a black hole for about 90 minutes yesterday. I barely escaped. I’ve always prided myself on being a local history geek, but I am stunned by the amount stuff I did NOT know about the Wornall family in Kansas City history. So far, I seem to only be working around the edges of my topic picking up tidbits of information here and there. Hopefully, this thing will start to come together when I write some papers and start to organize my research. 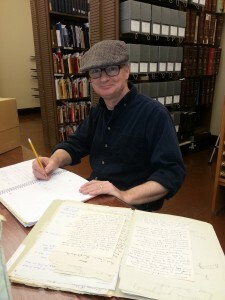 This entry was posted in HistoryMaking and tagged geneaology, Historic Preservation, Jackson County Historical Society, Kansas City, People, Public History in KC, Tony O'Bryan, Wornall-Majors House on March 4, 2014 by Tony Lawson-O'Bryan. In the few weeks since my last post, I have done some research for my internship that has reminded me about why cities are such fascinating urban spaces. Perhaps because they are often concentrated in one area, cities are overflowing with years of history just waiting to be peeled back and discovered. While learning about places that will be added to the book I am working on, A Place in Time, I am constantly reminded that these sites and site introductions are much more than words on a page. Moreover, these places represent so much more than a house with a history or a district with a personality, they represent people and generations of shared human experiences. What is also quite exciting is that while I write about these places I am given the unique opportunity of “going back in time” and picturing places in their original context. Take for example Brush Creek that runs along the Country Club Plaza. Before its development by J.C. Nichols it looked something like this. Granted, this is still a somewhat manicured depiction, but the swampy creek and the stone certainly dates the picture. 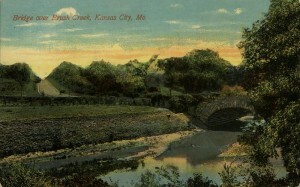 After Nichols’ development to the place and when people started to move into the surrounding area, namely wealthy homebuilders, brush creek began to look like this. 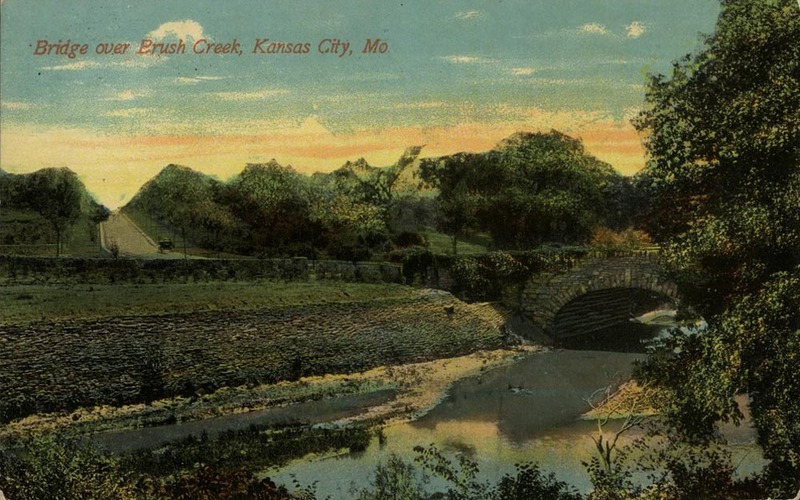 Every time I drive by Brush Creek now I picture it as a dense marshy swamp that was transformed not only by J.C. Nichols, but by everyday Kansas Citians. 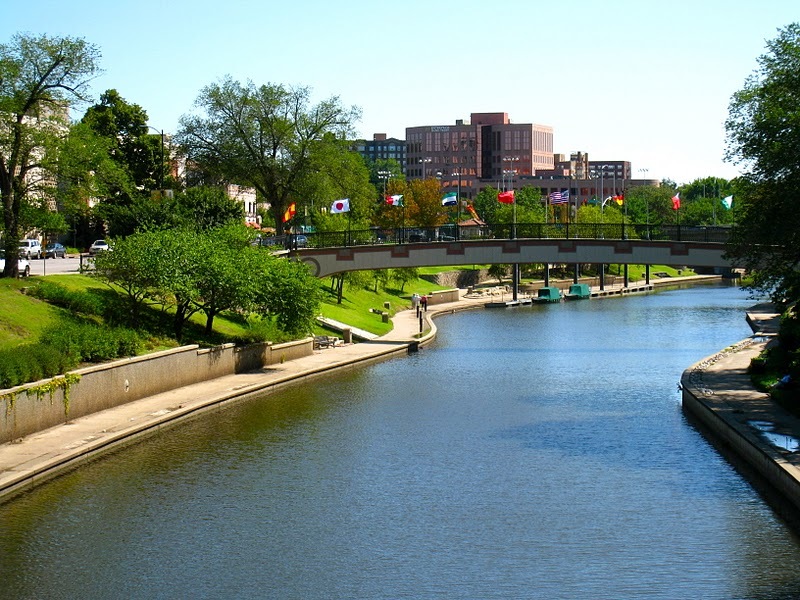 So what exactly makes Brush Creek so special? What makes the Country Club District so special? Well, for one there is an immense history that surrounds the area: Civil War Battles, famous real estate moguls, exquisite architecture, to name a few. All of these however seem lacking if we forget about the average citizens who created the place and made it what it is today. What started out as a dense tract of brushwood and farmland is now a world famous entertainment district and gorgeous community. Nichols was part of that, yes, but so were the settlers of the area when it was still a dream in the making. People often forget about those that lived in a area before them. I drive by the plaza everyday and never think of it as farmland that Nichols had a vision for and the homebuilders were apprehensive about. Now I see the whole Country Club District in a new way because I know a little of the history, but more importantly I know about the people who were brave enough to settle along the southern city limits and create a truly iconic neighborhood and community. As I continue to work on this internship, my goal is to remember the people and not just the place. I want to make sure that I tell a story that incorporates the story of the Kansas City citizen, not just the facts about a builder or a real estate developer. Jane Jacobs, author of The Death and Life of Great American Cities wrote, “Cities have the capability of providing something for everybody, only because, and only when, they are created by everybody.” If we think of Kansas City, if we think of the Country Club District as something created by generations of people then we are partaking in history and in a shared human experience. This entry was posted in HistoryMaking and tagged Cities, Historic Preservation, Kansas City, MO Historic Preservation Office, People, Shared Human Experience, Urban History on February 11, 2014 by Natalie Walker.